International Journal of Research in Health Sciences,2015,3,4,442-445. 1,4-3rdyear resident, 2–Assistant Professor, 3-Professor and HOD, 5,6–2ndyear resident, Department of Ophthalmology. PURPOSE: The aim of this study is to determine if the central corneal thickness (CCT) influences intraocular pressure (IOP) readings taken with a noncontact tonometer (NCT) and a Goldmann applanation tonometer (GAT). 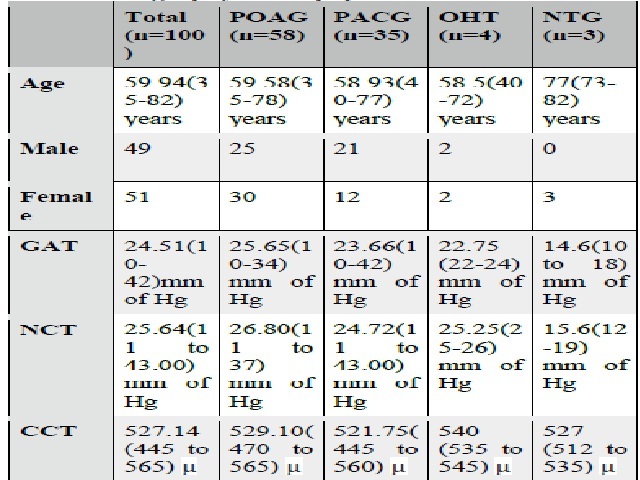 METHODS: 100 patients of POAG, PACG, OHT, and NTG were enrolled in this cross sectional comparative study. The difference in IOP readings between the 2 methods (NCT-GAT), were calculated and the relationship between the IOP readings, and CCT was analysed. RESULTS: IOP measured by both NCT and GAT was significantly correlated with CCT. NCT readings were significantly higher in the thicker group (CCT≥530μ) than in the thinner group (CCT<530μ). GAT readings had no difference between the thicker and thinner groups. An IOP value measured by NCT had a significant positive correlation with CCT .The value of IOP measured by NCT was significantly higher in the thicker cornea group, in patients of primary open angle glaucoma (POAG), primary angle closure glaucoma (PACG), and ocular hypertension (OHT) and normal tension glaucoma (NTG) patients. CONCLUSIONS: Measurements of IOP by NCT are more affected by CCT than GAT.Therefore CCT can influence the discordance of IOP readings taken with NCT significantly, whereas only minor influence is observed with GAT.